Card schemes enable a simplified and guaranteed exchange of money between merchants, customers and their banks, by operating international networks and setting uniform standards. More specifically, they define rules for the routing of payment authorizations and settlement requests in point-of-sale and e-commerce transactions between merchant acquirers and card issuers, as well as ATM withdrawals or purchases with cashback transactions. 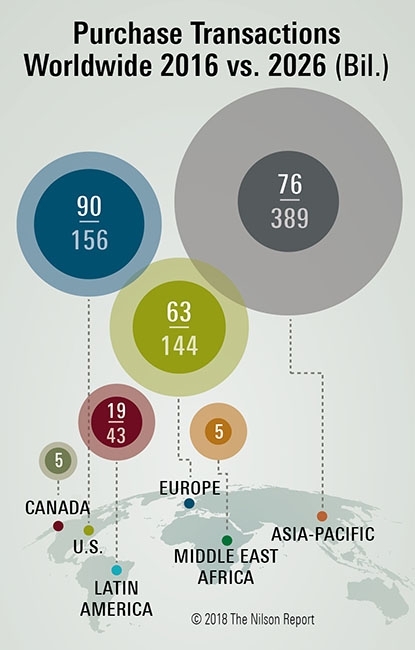 Figure 11 shows selected payment schemes (private, debit and/or credit) and their respective countries of origin - from national or regional schemes such as Girocard (Germany) and Cartes Bancaires (France) to big players like Visa (U.S.) and UnionPay (China). While surely not complete, the world map serves to illustrate the wide variety and regional distribution of extant schemes, with a lot of different players. Yet when taking a look at the underlying figures, the superficial visual appearance of diversity gives way to a quite different picture. One-third of the payment cards in worldwide circulation are private label cards, another third is UnionPay and the last third is divided between Visa, Mastercard and 1,2 billion domestic cards, together representing the rest of the cards in circulation (Figure 2)2. Private label cards are mostly retailer cards, such as issued by department stores (e.g. Macy’s, SAK, IKEA) or fuel station networks (e.g. Shell, Total). Many of those cards have no co-branding with Mastercard, Visa or UnionPay and thus only have limited acceptance at associated merchants. As the segment is very fragmented and due to those card’s limited usefulness, their share in overall purchase transactions and transaction volume is minimal. When considering only the three biggest card networks, UnionPay has by far the largest number of payment cards in circulation, followed by VISA with only 3,2 billion and Mastercard with 1,8 billion cards. 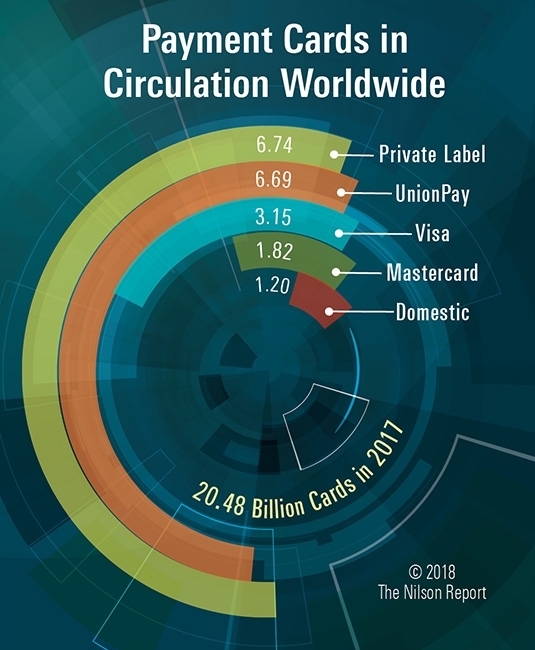 Circulation for other international card networks such as American Express (62 million cards) or JCB (9 million cards) is vanishingly small in comparison. These lower numbers are comparable with figures for cards in circulation for most domestic schemes, e.g. RuPay (459 million), Girocard (100 million), MIR (37 million) or Verve (20 million). The imbalance in the market becomes even more evident when analyzing the total number of transactions3. As seen in Figure 3, Visa alone accounts for 50% of all card transactions worldwide, with almost 150 billion out of an annual total of 300 billion. The second biggest player is Mastercard with 75 billion followed by UnionPay with 60 billion transactions. This leaves only roughly 15 billion transactions, or 1/10 of Visa’s transactions, for all other schemes, including domestic payment schemes. The number of annually processed transactions in Europe is 63 billion4. The only domestic scheme dominating its respective domestic market is RuPay in India, with a domestic market share of 65% for debit and credit card payments (and about 0,46 billion transactions). With respect to the total transaction volume (Figure 4)5, it is UnionPay that dominates the global scheme market, with a total transaction volume of about 15 trillion USD in 2017. The second largest player is Visa with 11 trillion USD, followed by Mastercard as a distant third, with a transaction volume of 5,2 trillion USD. The presence of these players differs significantly across regions. 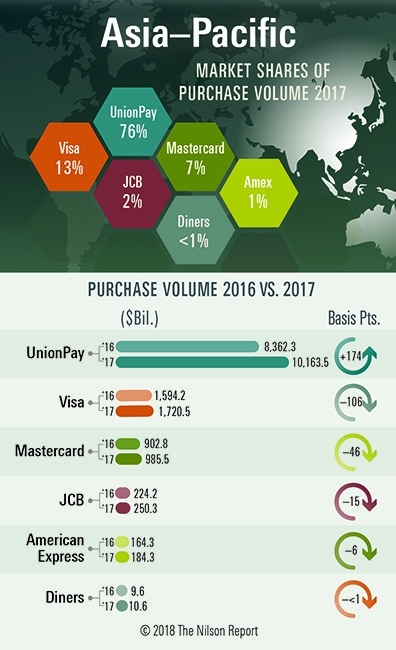 UnionPay dominates the Asia-Pacific market6 with a market share of 76% by transaction volume (ca. 10 trillion USD), compared to Visa with 13% at 1,7 trillion USD, followed by Mastercard with 7% or 1 trillion USD. In other markets, such as the U.S., Europe, Middle East & Africa and Latin America, Visa is the leading player with the highest market share by transaction volume, followed by Mastercard. UnionPay is barely present in these markets at the time of writing. Due to technological innovations, the payment market is experiencing rapid change. New baseline technologies, e.g. NFC, instant payments, or Open Banking API, and new regulations, e.g. PSD2, change the market forces. Meanwhile, the payment behavior of consumers is evolving towards mobile-first, whilst digital market offerings diversify, platforms (Amazon, Klarna, …) and apps (Uber, MyTaxi, …) establish new payment patterns, creating lock-in effects in the process. In result, some tendencies are generally observable: a) an increasing expenditure in e-commerce, b) an increasing convergence between e-commerce and POS payments, c) a preference for products which transactions are deducted directly from the account (i.e. debit cards, as opposed to credit products). Due to their oligopolistic market position, the major card schemes are shaping the market. Visa and Mastercard, for instance, are stipulating the rules for card-not-present transactions (generally e-commerce) by originating and mandating the 3Dsecure protocol for cardholder authentication or by promoting a global standard for NFC contactless transactions and mandating its utilization by card issuers in a next step. Due to their financial potency, broad customer base and innovative power, the big card schemes are not only mandating new processes and technologies, but are also providing proprietary solutions for the requirements they impose. For instance, this has happened with tokenization, a basic technology for card virtualization: The card schemes’ association EMVCo mandated the utilization of tokenization technology for mobile payments, while the card schemes were offering their tokenization services, like Mastercard with MDES or Visa with VTS, in a follow-the-free approach in parallel. Visa and Mastercard, originally being credit card schemes, used to also run debit brands in addition and with secondary priority, i.e. Maestro and V PAY. Domestic debit schemes (e.g. Girocard) generally are being co-badged with these, to deliver both high acceptance and better coverage worldwide. In recent years, the schemes introduced their next-generation debit products, Debit Mastercard and Visa Debit, which are closing the functional gap to credit cards (e.g. e-commerce capability and virtualization) while allowing for direct charging of the customer account. As co-badging has established an expectation among consumers that domestic cards come with international acceptance, both Visa and Mastercard are well positioned to achieve market penetration quickly. At the same time, both Visa and Mastercard aim to enter new business segments and global partnerships with fintechs or other big players, such as recently with Apple or PayPal to ensure that they remain a centerpiece even in those innovative payments scenarios. In order to set up a competing card scheme and make that endeavour viable, domestic banks and card scheme operators would have to achieve market acceptance, security and functionality equivalent to what the “Big Three” can offer. This means, for instance, that they would need to offer comparable proprietary solutions for tokenization or 3Dsecure at low (or no) additional costs, or new payment means in mobile and e-commerce. Yet, given the current shape of the market, likely contenders lack the financial means to shoulder the substantial up-front investments that would be needed, some of the necessary domain knowledge and also the required global bargaining power (e.g. vis-à-vis Apple) – among other things. Thus many issuers have decided in favor of the existing new debit brands Debit MC/Visa Debit and more are likely to follow. Moreover, it should be noted that the above strategic logic not only applies to payment services - it also goes beyond. The “Big Three” have realized that, with the digitization of the various market places progressing, a seamless and undisrupted integration of payment processes and identification services will increasingly become critical to business success. One obvious example is MasterCard´s current attempt to establish global eID services in major cooperations, thus extending Mastercard’s services far beyond their initial scope. Domestic or European initiatives started by industry consortia (e.g. verimi) or by banks (e.g. Yes) are rather likely to be affected by these developments. In overall consequence, the “Big Three” – the Visa, Mastercard and UnionPay triumvirate - are growing disproportionately, vastly outpacing the competition. The results are to be seen in the figures above. It may be helpful at this point to take a step back and consider the mechanisms that have shaped the situation as it is today. When abstracting historical developments a bit, four phases can be observed in which local markets are penetrated by global card schemes over time ( Figure 5 )7. Customers typically held debit cards, issued by their domestic banks like Sparkasse (Germany), Raiffeisen (Switzerland) or Citi Bank (U.S.). Those cards usually do not offer international acceptance. Therefore, after identifying a demand for international acceptance, domestic banks then address that demand by co-badging with globally operating card schemes (such as Mastercard or Visa), thereby adding their branding to the cards. In a third phase, the – increasingly dominant – global card schemes often start vertical substitution, e.g. by cooperating with new banks (e.g. N26 or Revolut) or other institutions that do not offer any card products based on domestic schemes. Over time, as market penetration of the global schemes deepens, domestic brands offer less and less added value and ultimately become obsolete. A development in this pattern has been ongoing for several years now - depending on the market, even for decades. In Europe, some national or regional payment networks still remain, such as Bancomat (ATM), Girocard (Debit) and Dankort (Debit). Nonetheless, these either offer different network services or are not leveraging technical innovations fast enough to remain competitive, let alone to become pan-European. From a European perspective the situation has even been regressing. Eurocard – as an indigenous credit card scheme and once the most dominant card scheme brand in northern and central Europe – might have been developed into a viable competitor to today’s “Big Three”. Yet it became increasingly irrelevant in its cooperation with American Interbank Card Association (ICA), later Mastercard International. Ultimately, after the merger in 2002, Eurocard was completely supplanted by Mastercard and the brand was (mostly) discarded. After the disappearance of Eurocard, the need for a European alternative to the dominant global card schemes became obvious. This brought about a few attempts by major European banks and the European Union, which manifested themselves e.g. in the Falkensteiner Circle8, Monnet Project9 or the Euro Alliance of Payment Schemes (EAPS)10. All those initiatives to establish a European card scheme solution failed and were consequently abandoned. Project Monnet, to pick one, failed due to a lack of legal security and reservations about the future viability of the business model – and maybe also due to both the involved individuals and institutions not being ready to forgo particular interest in exchange for common success. Today´s remaining initiatives are, for instance, TARGET Instant Payment Settlement (TIPS) by the European Central Bank (ECB), or EBA Clearing by the European Banking Authority (EBA). Those are good attempts at solving one specific problem by establishing instant payment systems. Yet – and crucially – they have only a very narrow focus: Instant money transfer between banks. Hence they can be described as an infrastructure rather than a product. But in order to qualify as a potential competitor to the “Big Three”, any solution would have to cover payment products and services far more comprehensively. All of this is surely no small task, and no institution or governing body in Europe is attempting it, yet. Meanwhile, the virtual global oligopoly is becoming ever more entrenched, with the Chinese scheme UnionPay dominating Asia, and Visa and Mastercard dominating everywhere else – not least in Europe, which is a highly attractive market due to its massive purchasing power. It comes as no surprise that European financial institutions and customers have already become largely dependent on American schemes. Competition: A market dominated by a few powerful players, such as the current card scheme market, cannot function effectively. The major players may set prices and slow or even stop differentiation without the risk of losing business. Arguably, the beginnings of such a development are already in evidence. It is currently only kept in check by the asymmetric threat of new, alternative means of electronic payment, which might act as a substitute for card-based products. Yet, as has been outlined above, the “Big Three” are increasingly successful in neutralizing that threat. Competition law and the respective governmental bodies obliged to enforce it, e.g. the European Commission within Europe, might have to intervene at some point. Anti-trust proceedings, enforced corporate break-ups, compulsory stakeholdings or the creation of new European champions (e.g. SEPA) are in the toolbox. Independence: Due to the current market environment, financial institutions, as well as customers in many regions, are dependent on the U.S. schemes Visa and Mastercard, as well as on the Chinese scheme UnionPay. In view of current global trade disputes and political tensions, it may be more relevant than ever to ensure independence. Examples include the U.S. sanctions on Iran resulting in payment shutdowns11, the trade conflicts between China and U.S. regarding intellectual property rights and trade imbalances or the cutting-off of Russian banks from the international SWIFT banking network over the Ukraine conflict12. History is replete with instances of financial infrastructure being leveraged for geostrategic gain. Data Sovereignty: Recent data leakage scandals, such as the Edward Snowden disclosures, provided evidence that digital information and telephone conversations of government leaders were intercepted13 by state agencies – with the help of private enterprises. Alleged (but not proven) foreign government interference in the last U.S. presidential elections also shows that data protection is of utmost importance for political stability. The current dependency on American and Chinese schemes, in combination with national laws such as the U.S. Patriot Act, amplifies the threat of financial data of foreign entities or of politically exposed persons being misemployed. Upholding sovereignty, territorial integrity and the state monopoly on the use of force are the classic domains of political institutions – but to translate that into appropriate policies, in the day and age of civil societies permeated by technology, and then to enforce those policies - that is a major current challenge. Groundwork still has to be laid. Conclusion – A Pan-European initiative is required now! From a (geo-)political perspective the question arises whether it is acceptable to allow a dependence with such far-reaching consequences for Europe. In view of today’s market developments and initiatives, such as the ones in Singapore or India (Figure 6)14, we would argue that there is a clear and present need for an independent trans-national (card) payment scheme, based in Europe. As of today, Europe is far from such a solution, especially one that considers required innovative mobile and (e-)payments infrastructure combined with digital ID-services. Whilst Instant Payment initiatives, like TIPS, SEPA Instant Credit Transfer or EBA Clearing are only targeting a small area (Instant Money Transfer between Banks) which is infrastructure rather than a product, others (e.g. Bluecode, Hippos) are, in the authors’ view, conceptionally clearly not conclusive enough, Girocard or others are progressing too slowly. Still, while the obstacles are major, they remain yet surmountable; but they evolve with time. Hence the best time to act is now. The importance of this issue should be recognized within government departments from ministerial level down, within subsequent government agencies, within the boards of financial institutions – and, of course, by the general public. Furthermore, the issue appears to be worth (and requires) a concerted attempt on truly Pan-European scale. It should not only be initiated by the financial or public sector, but also be supported by governmental measures, leveraging competition law. Oversight by legislative and regulatory bodies of national and European security might be warranted. To be successful, and to master the challenges encountered by previous initiatives, such an endeavour should be a resolute, long-term governmental and supranational initiative. Strong and constructive legislation could allow the private sector to develop robust and viable business models – which also accommodate and further common European geo-strategic interest.